You gotta love things like this that help keep your life in order. Chances are if you're heading anywhere you're gonna need some luggage. This bag is by far one of the coolest bags we've seen and screams 'adventure'. Who else do you know that has water proof luggage? Be the first on the block and enjoy a super well made, very versatile expandable luggage system. Sold as a SINGLE bag. Buy just one and you'll have a great bag. Buy 2, 3 or 4 and you've got a SYSTEM. Connect them all on your roof, in your trunk or wherever they will fit and drive into the sunset. Use the Auto Duffle Bag’s side pocket to stow the removable shoulder strap or the attachment straps when not in use. The bag’s wide zippered opening allows you to pack with ease. The Auto Duffle Bag is a one-bag-fits-all-applications storage solution for your vehicle. 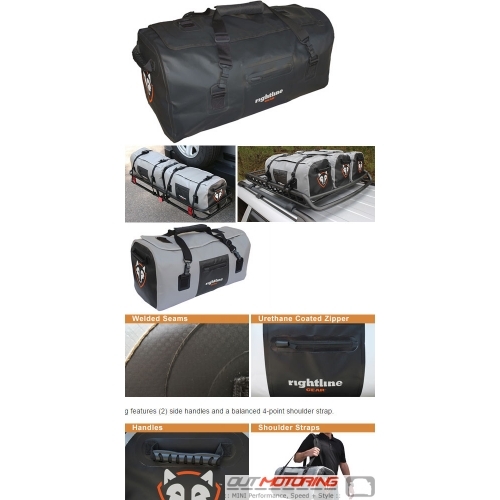 The weatherproof Auto Duffle Bag is designed to carry your gear on or in your vehicle. The bag’s unmatched flexibility makes it useful in a wide variety of applications. Keep one packed for each of your favorite activities and be ready to roll at a moment’s notice. The Auto Duffle Bag works great for off road gear, beach gear, clothing, camping gear, food & snacks, sports equipment; you name it. Load up your truck bed, cargo basket, hitch rack, or trunk space with as many Duffle Bags as needed. The included straps will attach the bags to any of these cargo carriers. Use multiple Duffle Bags on the roof of compact cars, sedans, wagons, crossovers, SUVs, WITH or WITHOUT a roof rack (will NOT fit the MINI models unless installed/strapped to a rack system due to the auto window feature). Connect the included straps to a roof rack, roll bars, or run them through the vehicle (will not work on a MINI due to the auto close windows), or add the Rightline Gear Car Clips (sold separately) to attach them to the vehicle’s door frame. Includes: duffle bag, (2) nylon straps, and complete set up guide. Available in Black or Grey. Sold as a single bag. Contact us for accessories such as clips, extensions, etc.